Rebecca is currently an Associate, Entrepreneur Selection & Growth at Endeavor Miami. Prior to her joining Endeavor, Rebecca worked with education economics at the National Bureau of Economic Research. There, she performed econometric analysis to determine the impact of educational programs in Massachusetts. 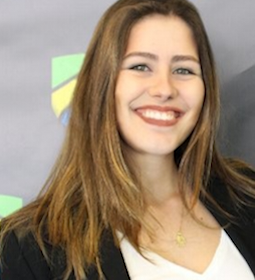 Before NBER, Rebecca worked at Ambev, the largest beverage company in Brazil and a branch of Anheuser Busch-Inbev. As part of the Corporate Relations team, Rebecca planned one of the pillars of ABI’s Global Smart Drinking Goals to be implemented in Brazil. Rebecca is passionate about economic development and finding solutions to city problems. A keen generalist, she has worked in the private, public and third sectors to understand the best mediums to promote change and sees great potential in the fast-growing entrepreneurial ecosystem in Miami. She’s excited to support local entrepreneurs in making their high-impact businesses scale and contribute to Miami’s growing economic presence in the international stage. Rebecca was born in São Paulo, Brazil, and moved to the United States to get her B.A. in International Relations, Economics and Political Science. She graduated with honors from Tufts University in 2018.